I’m a musical gear-aholic. My apartment is littered with instruments leaning against walls, stashed in corners, and propped up in closets. I’ve never met a guitar or keyboard I didn’t like. 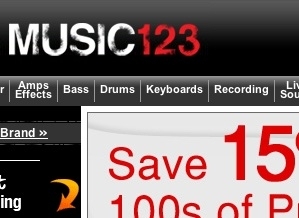 Having said that, while I frequent online music malls, I’ve never shopped at Music123.com. That site is similar in many ways to other musical instrument websites in that the focus is on brands and products, and the variety of choices is quite large. At the end of the day, though, the same search engine optimization parameters apply to music stores as they do to any other ecommerce entity. Staff of Music123.com requested this review, so let’s strap this site on and turn up the SEO. Search engines love textual content, and as long as it’s focused, the general rule is the more the better. Music123 has a distinct lack of such content as most of the page is graphical. The homepage doesn’t feature heading tags either, which offer a way to highlight focused keywords. Search engines give extra weight to words in heading tags, and so it’s a good idea to have heading tags on the homepage and throughout the site. On the positive side, there are links to many categories in the site, and while an internal sitemap does not seem available, linking from the homepage is deep and complete enough to make up for it. The links also incorporate keywords in the form of types of instruments, subcategories of instruments, and instrument brands. While some text is contained in graphics, and therefore is not read by search engine spiders, much of that content is duplicated or represented in the textual links. PageRank for the homepage of the site is 6, which is respectable. PageRank is built primarily on the number of quality, inbound links to a given site. The higher the PageRank, the more likely it is that pages in a site will come up in Google and other search engines for a given query. With regard to inbound links, Google sees 527 links while Yahoo! sees 32,561 links coming in. These are good numbers, though fresh content in the form of a blog could help in attracting even more links. Google reports 713,000 pages, Yahoo! sees 352,531 pages, and MSN Live Search shows 37,300 pages. These numbers offer quite a bit of discrepancy. Issues of duplicate content could be in the mix, especially with Google’s numbers being just about double those of Yahoo!. Conversely, the relatively low indexation by MSN suggests that Live Search may have issues getting deep into the site. XML sitemaps can be helpful in assisting MSN with deeper indexing, and that technology does not appear to be in use at Music123.com. Text-based navigation is used throughout the website, and the text is reflective of keywords. Linking within the site is thorough. On the product level, the use of keyword-rich text beneath each product is quite good, but category and subcategory pages have varying degrees of content. Descriptive textual content at every level is always best for search engines. Keywords are generally descriptive and often reference brand, which is integral to a site of this size and focus. Unique title tags are being generated, it would appear, automatically. They are generally focused, though sometimes the titles do not reflect the level at which they reside. Going into the bass category, for instance, and then choosing “straps” within that category results in a title tag that says “Straps from Music123.com.” No mention of bass or bass guitars is made. There is also inconsistency in branding; some title tags include “music123.com” while others don’t. Every title tag should include the site name for branding purposes. A typical Music123.com URL looks like this: www.music123.com/Electric-Guitars-Guitars.Music123. From an SEO point of view, this is a quality format. Dashes between words are viewed as spaces by the search spiders, and therefore make it easier for search engines to distinguish words within the URL. Keywords are reflected throughout the site’s URLs. 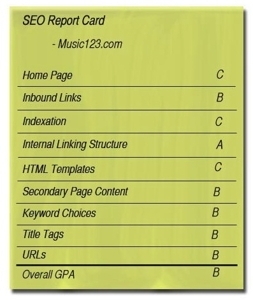 While not perfect, Music123.com reflects good core SEO principles. More keyword-focused textual content on the homepage could be helpful, and it does seem odd that a Memorial Day Special is still being advertised almost a week after that holiday. Indexation is dramatically different in the search engines, which points to some sort of issues with both duplication and crawling barriers. Nonetheless, the site has solid navigation and overall reflects focused keywords throughout a very large site.